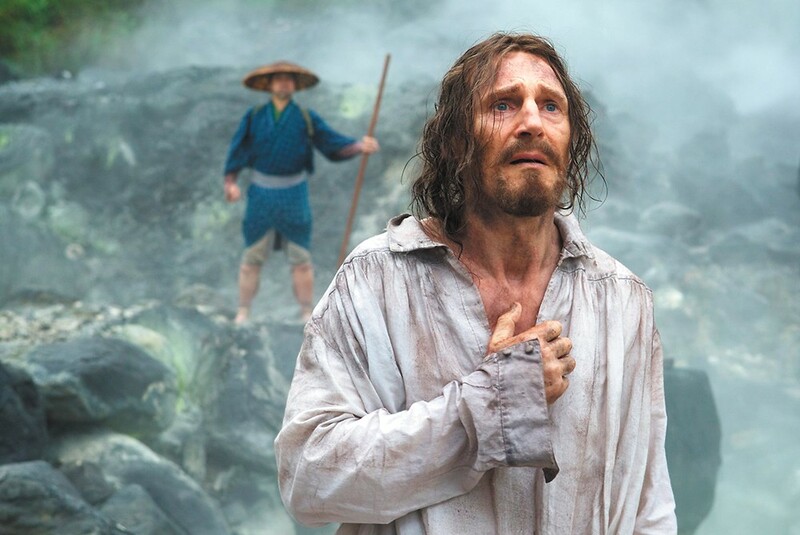 Liam Neeson is priest trying to survive in feudal Japan in Silence. Father Rodrigues (Andrew Garfield), whose spiritual journey is the subject of Martin Scorsese's Silence, is certain that God hears the faithful's prayers, but wonders why the same God turns a deaf ear to their screams. These are the screams caused by physical torture, not the plaintive wail of everyday woes. The agony of His silence is almost enough to make this Jesuit padre doubt his faith, but Father Rodrigues' pride won't allow him to believe that his ministrations are in vain. Set in 17th century Japan, the film takes place during the feudal shogunate era when Western influences and religions were outlawed on the islands. Catholic missionaries were banished or tortured to death if they refused to renounce their religion, and those who remained among their Japanese converts were forced underground into covert communities of faith and rudimentary rituals. It's easy to see how the promise of paradise everlasting after death appealed to the Japanese peasantry, whose brutal lives offered few other rewards. The film is based on the 1966 novel by the author Shusaku Endo, and it has been Scorsese's longtime desire to make a movie from the material. Following The Last Temptation of Christ and Kundun, this is Scorsese's third go at strictly spiritual subject matter, and it is his most concentrated and engaging of the trio (even at more than two and a half hours). The film's stunning beauty (it's filmed by Rodrigo Prieto, who also worked with Scorsese on his previous feature, The Wolf of Wall Street) contrasts with its thematic austerity, which curiously opens up the movie for endless contemplation. Silence bears a similarity to the more theological films of Robert Bresson and Carl Theodor Dreyer, works described as "transcendental cinema" in an important essay by Paul Schrader. The opening sequence sets the film's overall tone, as the sound of crickets gives way to the thick fog that will come to envelope so many of the scenes. Then the primordial-seeming landscape opens up to a display of severed heads and the first of many scenes of the sadistic torture of Catholic priests who refuse to apostatize. To this foreign land come two Portuguese Jesuits, Fathers Rodrigues and Garrpe (Adam Driver), in a martyr's quest to find their former mentor, Father Ferreira (Liam Neeson), who has disappeared amid the mass exterminations and renunciations. Most of the film is spoken in English, but the effect is a little disconcerting, since the Portuguese-inflected English is delivered in various accents and the broken English spoken by the Japanese converts seems too articulate for the situation. And despite the vivid depictions of the heartless tortures inflicted on Catholics, it's impossible not to think back to the Crusades and Inquisition, when the roles of the torturers were reversed. Still, great thought is given to weighty theological matters in a way that makes the current wave of Christian filmmaking seem completely puerile and shallow. Silence is not showing in any theaters in the area.